As I was about to publish the post below, I heard that the good news story that had been unfolding all last week at Piper Spit on Burnaby Lake had come to a sad end. 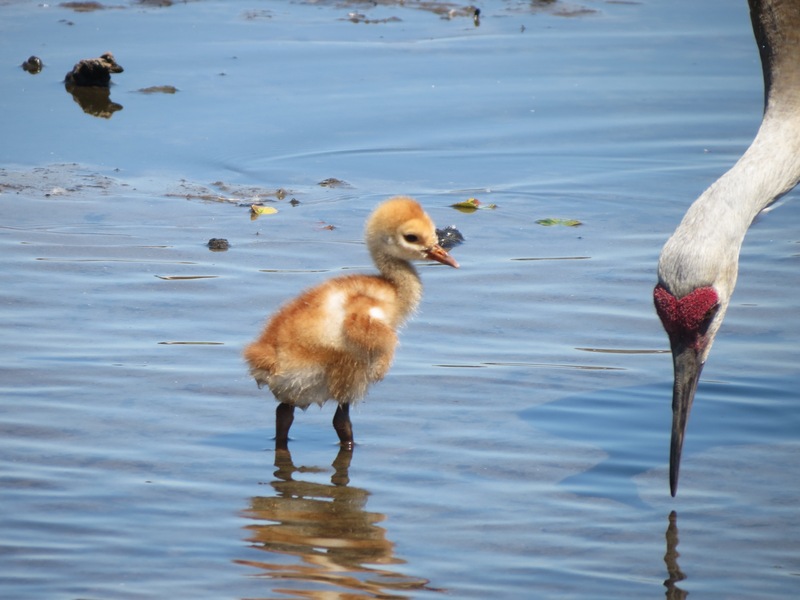 The Sandhill Crane chick (colt) pictured below is no longer with its parents, and has likely died from some unknown cause. 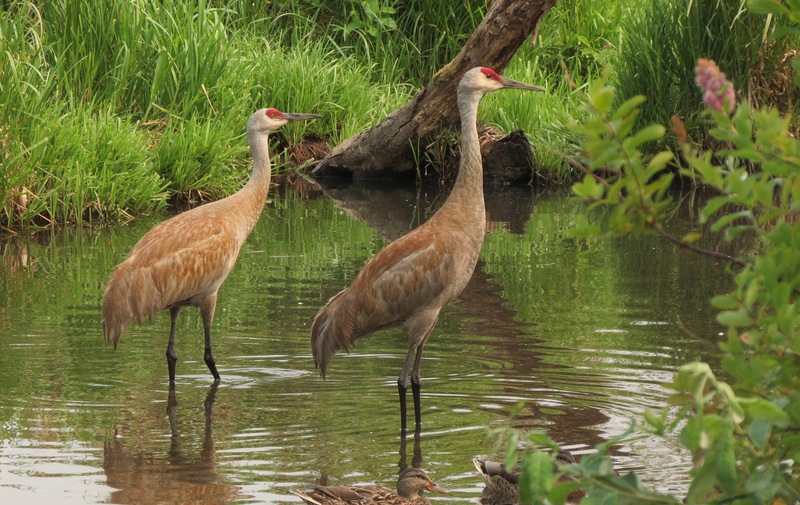 To document the cranes’ story I have decided to let the original post stand, with some slight modifications, because it’s such a good story, and worth telling. While many will consider the outcome a local tragedy, it does illustrate how precarious life can be in the wild, especially for young animals. Survival rates are often low. Let’s hope the cranes nest again next year. There’s a good chance they will, and we can all hope for a better outcome. The risk with a post like this is that the story gets buried in the overabundance of cute at its centre. Now I’m not denying (how could I?) the cute factor here , but the story is the historical first that this new arrival represents, and the cute needs no elaboration from me. Just look at the pictures. 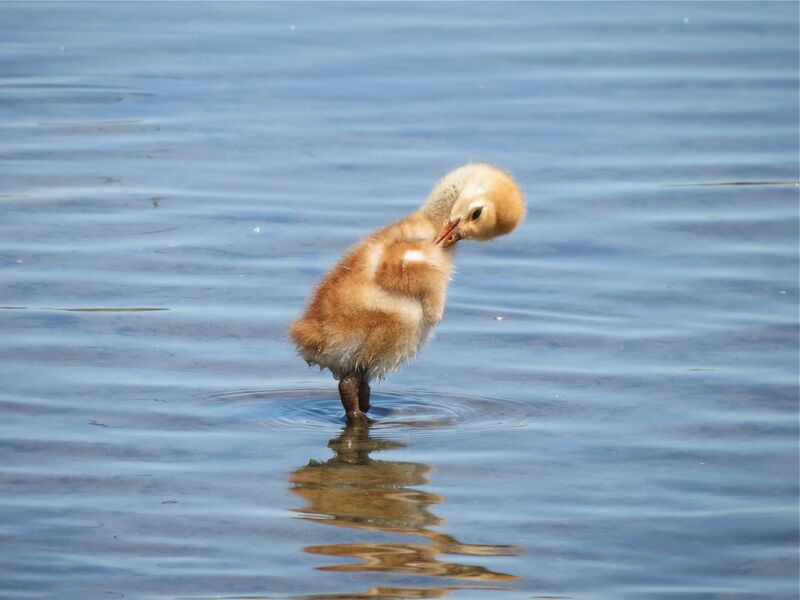 And while the chick may be the epitome of cute, let’s not overlook that we’ve got one of the Lower Mainland’s most majestic and uncommon birds breeding right here at Burnaby Lake for the first time since we’ve been keeping records. And they’re putting on a show for everyone. How do I know these birds have set a breeding record here? 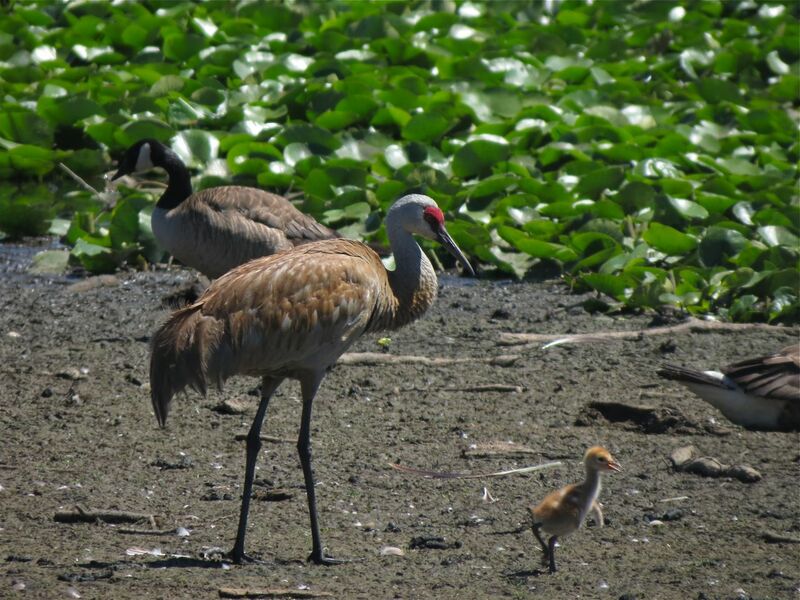 A quick search of the literature shows that this new arrival is the first record ever record of breeding Sandhill Cranes at Burnaby Lake, and anywhere else in Burnaby for that matter. The chick pictured above, the first day I saw it, is just a few days old, and was being fed and guarded by both parents. Watching it, I was surprised to see it was picking at and eating some food items independently, which is notable for such a young bird. Usually the parents supply all its food requirements at this early age. 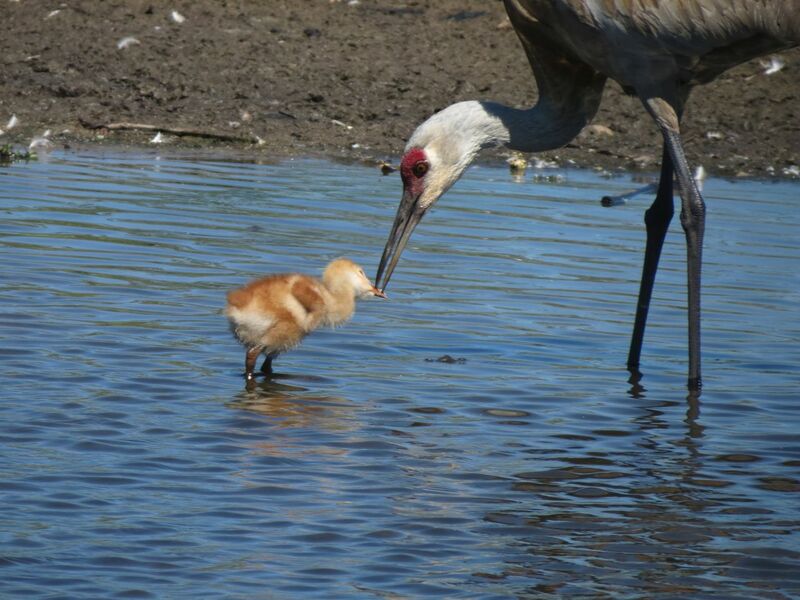 After their natal down has dried, and within 24 hours of hatching, Sandhill Crane chicks leave the nest permanently. Such behaviour defines these hatchlings as nidifugous (Sorry, couldn’t resist such an unlikely word), and then they’re off on the risky journey to adulthood. 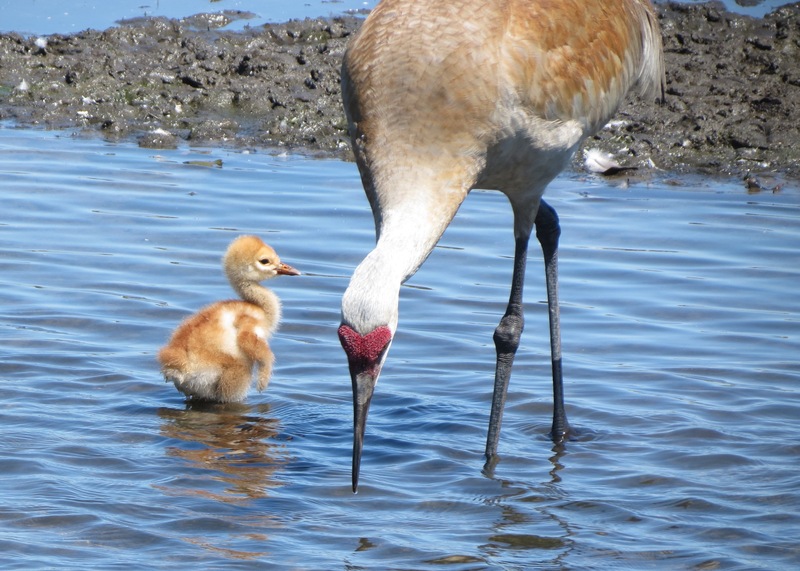 Sandhill Cranes are rare breeders in only a few locations in the Lower Mainland/Fraser Valley. The wetlands south of Pitt Lake in Maple Ridge were their breeding centre for many years, with just a few pairs actually nesting there. A few more bred in Langley. We do see large flocks of Sandhill Cranes in the Lower Mainland, but only in migration – spring heading north and fall flying south. For the most part these birds continue on their migrations and we are fortunate to see them when they pass over. However, over the past decade or so, a small breeding population has established itself at the Reifel Migratory Bird Sanctuary in Delta. Birds, likely from that population, have been turning up in Richmond, where they started to breed about five years ago (first time since 1946), and they’ve also been showing up on our local golf courses, where they haven’t nested, perhaps from dodging flying golf balls! 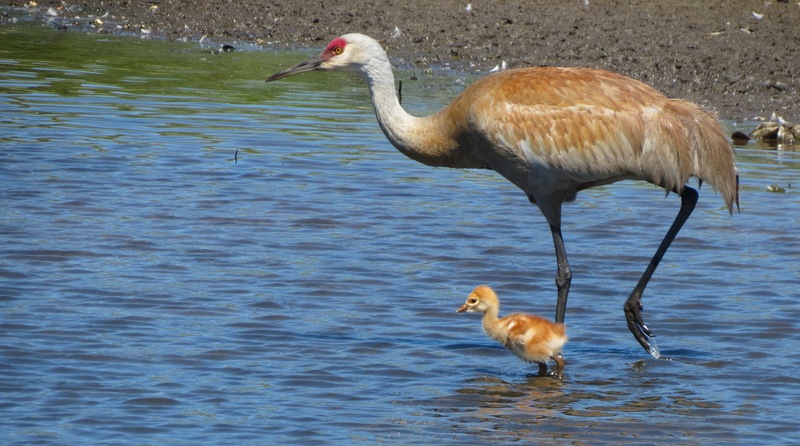 In British Columbia, Sandhill Cranes breed mostly in the Central Interior (Northern Okanagan and the Cariboo/Chilcotin, with some breeding in the north east (Fort Nelson area), and others on the central coast islands and Haida Gwai. Breeding in the Lower Mainland is much less common. 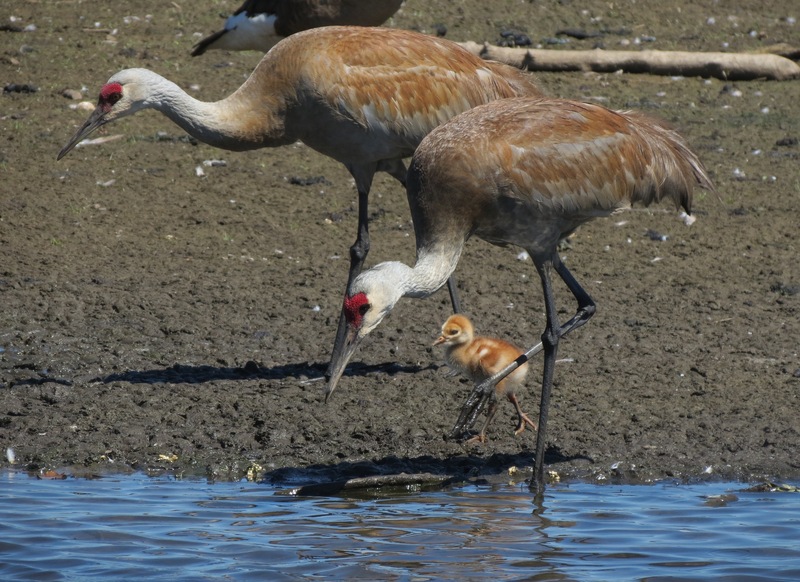 Sandhill Crane chicks grow rapidly, and “our” Burnaby bird seems to be doing just that. Compare the picture taken June 26 with the one here below taken July 5th. Junior is gaining height and bulk, and both parents are supplying it with food. Unlike many birds that spend their first weeks in the nest, nidifugous birds are incredibly mobile for such young animals. It can wade, even on its junior-sized legs. Or, it can simply look disarmingly cute. Sandhill Cranes have been showing up irregularly at Burnaby Lake for the past few years. This year they clearly stayed to breed. Between one and three eggs is the usual clutch size, with two being typical. One or two young are usual. Both parents incubate the eggs, although the female does the overnight shift which means she does about 70% of the incubation duties. Once the chicks leave the nest, both parents protect and feed the young. 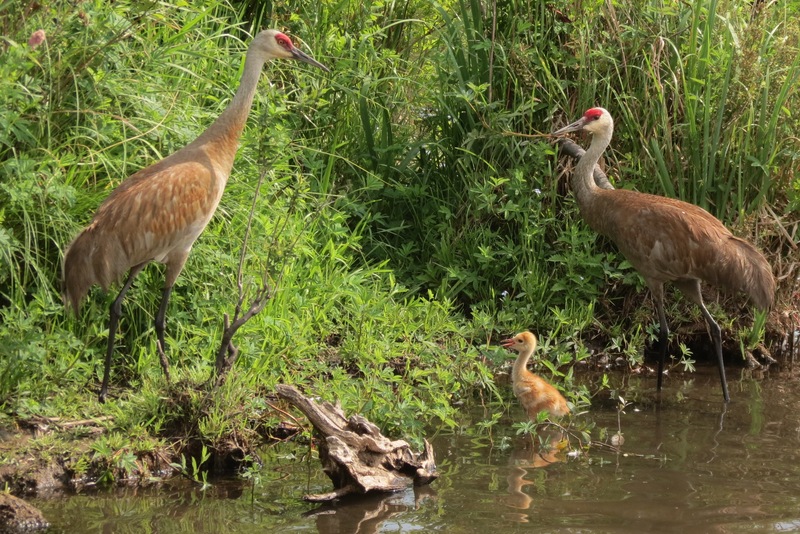 Sandhill Cranes are monogamous and tend to maintain pair bonds over many seasons, especially if they successfully breed together. So barring accidents, this pair may be together for the long haul. As to which is the male and which the female, the birds know of course, but the sexes are similar and not separable by appearance. During their courtship displays though, the males and females can be identified by their specific bugling calls and head motions. 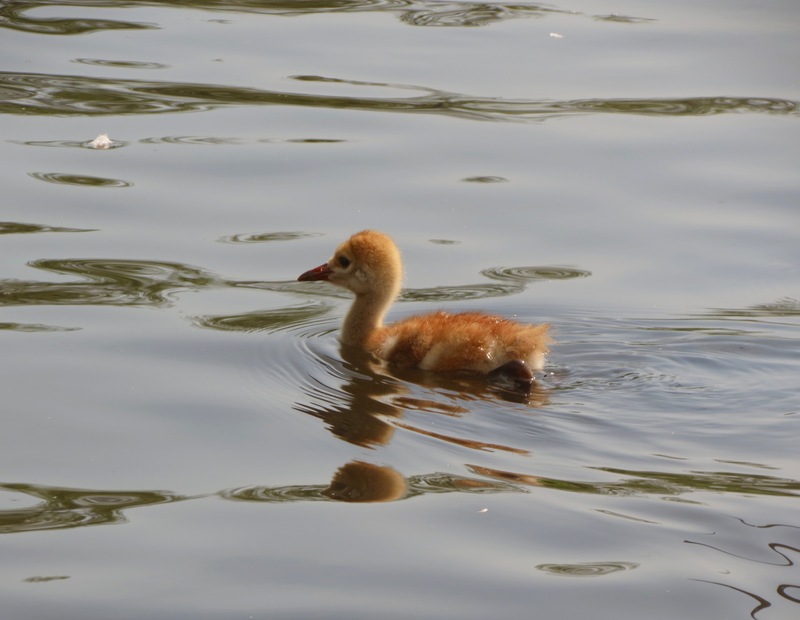 I headed down to the lake this afternoon (July 6) to confirm the reports of the chick’s disappearance. Sure enough the two parents were there, occasionally bugling quietly, but no chick was in sight. Given the birds’ extreme attentiveness to their young, the conclusion has to be that the youngster is dead. It was apparently showing some respiratory distress yesterday which got progressively worse during the day. The chick was nowhere to be seen this morning. A sad ending, but there is hope for next year.